Stripe currently supports 12 languages, 25 countries, and 135+ currencies. WP Simple Pay Pro lets you set the locale (language) for your checkout overlays as well as the preferred date format, currency, currency format, and tax rate for your site’s region. For example, some companies based in France may need the French locale, an alternate date format, Euro currency, right align the currency symbol position and use commas in place of decimals. In your WordPress admin, go to Simple Pay Pro → Settings → General. Here you can modify any of these settings for your entire site. 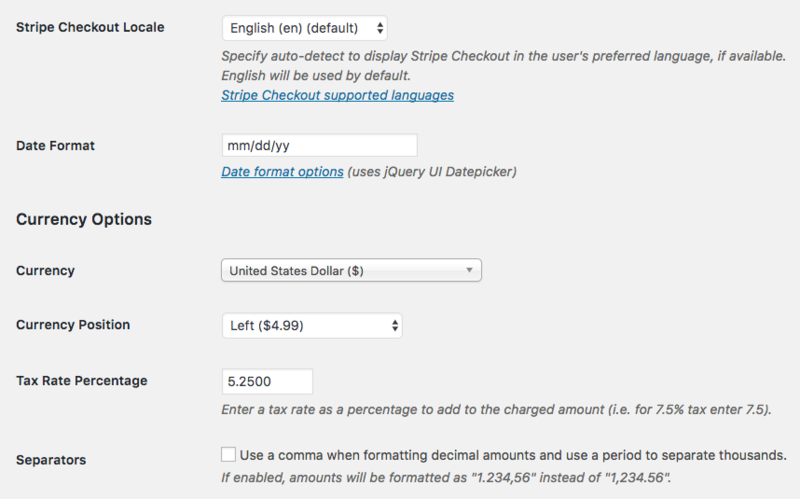 Stripe Checkout Locale Specify auto-detect to display Stripe Checkout in the user's preferred language, if available. English will be used by default. Date Format Specify the date format to be used with custom date fields (which in turn use the jQuery UI Datepicker). Defaults to "mm/dd/yy". Currency Set the currency for the payment form. Select or search for any supported currency. Currency Position Select left or right side with an optional space separating the currency symbol and amount. Tax Rate Percentage Enter a tax rate as a percentage to add to the charged amount for all payment forms (i.e. for 7.5% tax enter 7.5). For subscription invoices, taxes use Stripe's native tax property and will show up as a separate line item for each charge. Rounded to the fourth decimal. You can set this to add any sort of percentage fee to the total (not just tax). For one-time payments, the percentage tax/fee will be saved to the charge metadata. For subscriptions, the percentage tax/fee will be saved to the native tax_percent property. Separators Use a comma when formatting decimal amounts and use a period to separate thousands. If enabled, amounts will be formatted as "1.234,56" instead of "1,234.56". Also set the option in your Stripe dashboard under Business > Data.